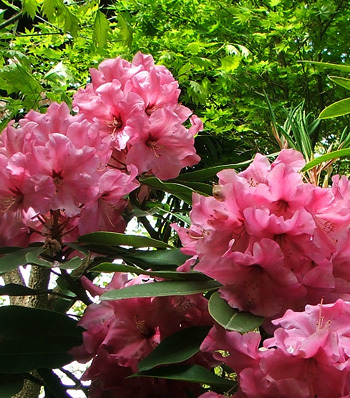 This beautiful pink rhododendron grows in the side garden of the Pond Paddock. It flowers reasonably late in spring - at the same time as the Japanese Flowering Cherries in the nearby lawn. What a pretty sight! This was one of my first serious rhododendron purchases. I remember not being sure whether they would like growing in my garden - would the ground be too dry? Would there be enough shade? 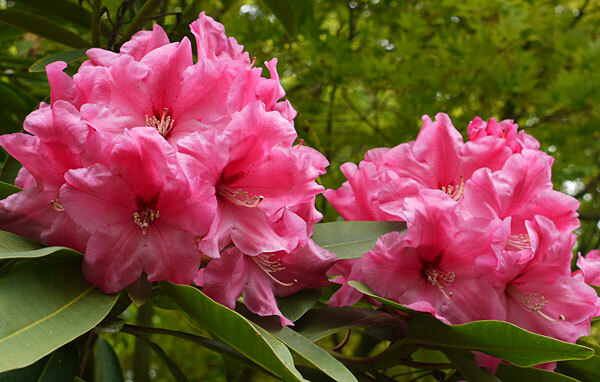 I was a rhododendron novice, and imagined I needed deep and specialised gardening wisdom. Those were the days! Mind you, I have had a few small rhododendron disasters since. But now, I think I understand these lovely, noble shrubs a lot better. I'm sorry to say that I didn't save the label, or write down the variety name. Typical!